“Play it again, Sam.” Those words never rang more true than in today’s repurposing pianos feature. For sure, the following DIYers have “played it again”, reinventing these players into beautiful decor pieces that hit several design notes including creativity, functionality and style. If you’re no longer tickling the ivories in your home, see how you might reinvent your “88s” into a new kind of musical masterpiece. Repurposed piano full bar and cabinet (top photo): an old 1896 piano was gutted but is now filled with the “spirits” of music. When the cabinet doors are closed this literal piano bar still looks like a piano. Extra cool factor? There is room under the the keyboard cover for shot glasses and stir sticks. Repurposed piano planter: with so many damaged players from hurricanes and floods, it’s a shame to let them go to waste. With a bit of urban flair, a talented DIYer reconstructs and repositions the piano strings as stenciled birds fly amongst planted flowers that now play silently beautiful, decor music. Repurposed piano fountain: I’m almost certain TLC would have included this piano in their “Waterfall” video. It’s definitely a work of garden art. Repurposed piano book case: reinventing an iconic musical piece of furniture takes a great eye and lots of DIY imagination. This early 1900s piano, built in the Riga Musical Instrument Factory, was gutted and the body was made deeper in order to allow room for large books. It was ultimately reworked then coated with cherry wood veneer to last far into the next century. See Also: how one of our HomeJelly readers repurposed a found piano into a grand kitchen island. Repurposed piano electric keyboard with music library shelf: you might say this is almost more of an update than a repurposing project. An 1890’s piano was so loved by its owner that instead of tossing it, he decided to keep its functionality in tact, so to speak. The keys were replaced and the housing was retrofitted to accommodate his electric keyboards. The strings were then removed and a shelf was installed to keep music books and equipment handy. 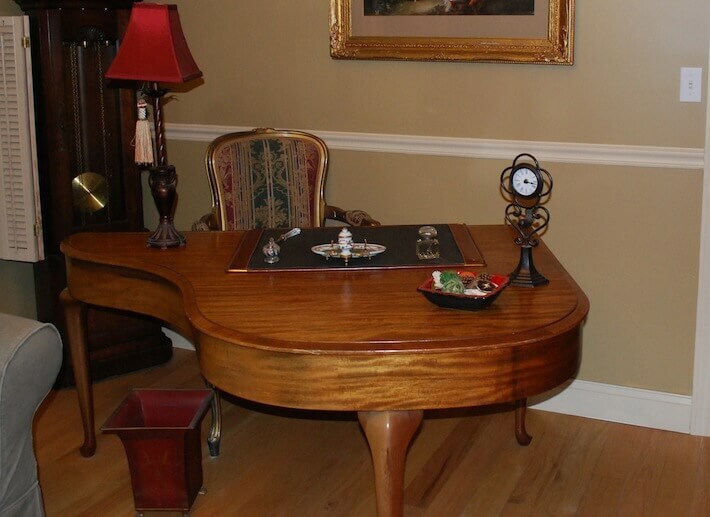 Repurposed piano desk: who knew a baby piano was the perfect size for a home office desk? This piece was reworked and finished to suit scribbling instead of serenading.